Welcome to the 7th Annual Acton-Boxboro-Maynard PMC Kids Ride! It's that time of year! 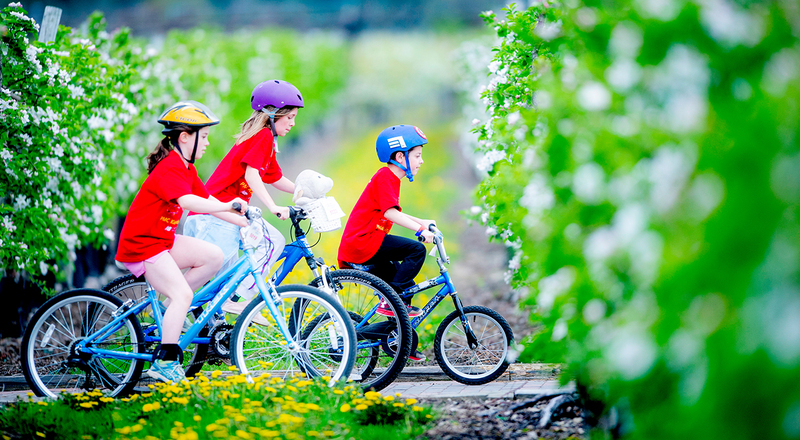 The seventh annual Acton-Boxboro-Maynard PMC Kids Ride will take place on June 2, 2019, from 8:30 am to 12 pm at NARA Park in Acton, and we are hoping to have 200+ kids of all ages participating in this event. 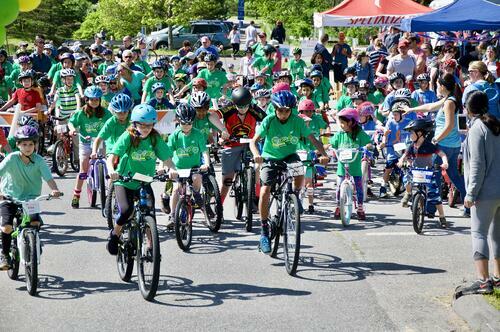 Last year we had over 200 kids come out to ride raising over $53,000 for Dana-Farber! Help us surpass last year's success by signing up today as a rider or volunteer! The PMC Kids Rides program became an official PMC program in 2005 as a way to include young cyclists in the Pan-Massachusetts Challenge's (PMC) mission of raising money for cancer research and treatment at Dana-Farber Cancer Institute (DFCI). Since then, PMC Kids rides have raised over $9 million. The program engages youth in philanthropy, instills the value of working for the benefit of others, and promotes athletic fitness and physical activity. The PMC Kids Rides program offers children, parents, and neighbors an opportunity to work together to create individual bike-a-thons in neighborhoods, at schools, or in business complexes. These rides enable children to ride their bikes and solicit sponsors to donate money to cancer research. 100% of all money raised at this event and by the children will go directly to DFCI via the PMC. In 2018, the Pan-Mass Challenge raised $56 million for Dana-Farber. Make the commitment to join us because you want to help cure cancer! This ride is dedicated to all of our loved ones whose lives were cut short by cancer and to those who continue to inspire us as they live with cancer. The Acton-Boxboro-Maynard PMC Kids Ride will bring us "closer by the mile" to a cure! We look forward to seeing you at the ride and thank you for your support! 8:30 to 9:30 am: Bike check and decorating – have your bike and helmet inspected by Pedal Power before the ride and then decorate it! 9 am to 12 pm: Fun at NARA park! Enjoy music, food, face painting, crafts, bike decorating, games, and cheering on your friends! Designated parking for the event - The entire event will be held up by Miracle Field. Part of the upper parking lot will be closed off as the Big Kid ride will go through there. If no parking is available in the upper lot, please park in the back spots of the lower lot by the beach and walk up the walking path to our registration area. Parking attendants will be on location to help direct you. 6:30 am and on – Volunteer Check-In. Check in at NARA Park by the upper parking lots. Meet with Crew leaders. Review job expectations/responsibilities. Please be prompt on your arrival, and wear comfortable shoes. We will provide you with a volunteer t-shirt that you must wear. Please indicate your size when signing up online. 8:30 to 9:30 am – Rider Check In/Registration. Pick up t-shirts, water bottles, and bike numbers. Hand in money raised through fundraising in the form of a check. We will have envelopes and labels for each rider. PMC Kids prefers, however, that donations be processed on-line through the website. Please attach bike number to your child’s bike. Please bring bike to designated bike parking area and take note of where the bike is parked. 8:30 to 9:30 am – Bike and Helmet Check and Bike Decorating. Bike and Helmet Check by Pedal Power. Have a professional check your bike and helmet for safety. Once you've had your bike checked, feel free to decorate it with all sorts of fun supplies! 9:30 am – Opening Ceremony at NARA Park by the Miracle Field. We will recognize Heavy Hitters and take a group photo. 9:30 to 11 am – Bike Riding begins. Little Tykes will start the ride down the NARA Park loop towards age Miracle Field. The rest of the riders will start in staggered groups. Riders will travel the loop as many times as they would like. There will be volunteers set up around the loop and bike marshals looping around on bikes. Remember though, THIS IS A RIDE NOT A RACE! Only volunteers and riders should be on the walking path. The Younger kid ride will occur simultaneously as the big kid ride, with a loop around Miracle Field. This loop allows parents full view of their children to assist with newer riders. 9 am to 12 pm – Fun at NARA Park. There will be food, face painting, music, crafts, bike decorating, tattoos and much more! NARA park walking path. This big loop is for the "Big Kids" riding on two-wheeled bikes. Miracle Field loop. This loop around Miracle Field is a smaller path for kids riding big wheels, trikes, bikes with training wheels or just starting out on two wheels. ALL RIDERS (CHILDREN AND ADULTS) MUST WEAR PROPERLY FITTING AND SECURED BIKE HELMETS. Representatives from Pedal Power Bike Shop will be on hand to provide complimentary bike safety checks and handle minor bike repairs. Please review Bike Path Safety and Etiquette prior to the ride. Teenagers and adults of all ages are welcome to register online as volunteers. There is a role and need for everyone! Please click "register to volunteer” for descriptions of the volunteer positions. If you do not fit in one of these positions, do not fret – we will find you the perfect spot. Parents, please sign up as a volunteer ride marshal if you would like to ride. All volunteers will receive a t-shirt and lots of thanks! We extend huge thanks to the local businesses, organizations, and individuals that have helped make the 2019 Acton-Boxboro-Maynard PMC Kids Ride a success through their generous support. Please note who our business sponsors are and return the favor by thanking and patronizing them. Last year, supporters like you helped make it a HUGE success with more than 200 riders raising over $53,000 for Dana-Farber. Help us surpass last year's success by becoming a tax deductible supporter! Participating as an Acton-Boxboro-Maynard PMC Kids Ride Supporter will put your business/organization name, logo and description in front of active market customers who will learn of your commitment to the PMC mission. Please see the details of support levels below. We hope you will consider becoming a Supporter for the Acton-Boxboro-Maynard PMC Kids Ride. For questions or more information, please contact us directly via email at pmckidsab@gmail.com.